There is a useful scrum exercise, or technique, called Silent Grouping that can be used on its own or to compliment Planning Poker, allowing large sets of user stories to be sized in minutes. Silent Grouping has several advantages. For one, it is fast, which in turn leads to significant time and cost savings. 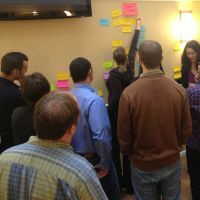 Getting the team together, the facilitator asks everyone to group related items using sticky notes or cards — without talking, relying only on the individual placement and movement of items typically cards or sticky notes) as a means of communicating and coordinating among the participants. The Silent Grouping Exercise is most useful when implemented to size user stories or in a retrospective. We use this Silent Grouping Scrum Exercise in my classes.